Karate officially added as an Olympic sport for Tokyo 2020 ! "The WKF (World Karate Federation) has members in 192 countries, and international regions with more than 100 million enthusiasts. Karate-Do is highly respected, particularly in Europe, and renowned as a traditional cultural aspect of Japan. We believe these factors, observed at the IOC General Meeting, allowed Karate to become officially recognized. Karate competitions will have 8 events as originally proposed - 3 Men's Weight Category Kumite, 3 Women's Weight Category Kumite and Men's & Women's Kata Categories, with a total of 80 participants, 40 men and 40 women. The event is planned for 2 days and the weights for each category will be determined later. The IOC General Meeting, to decide the additional sporting events for the 2020 Tokyo Olympics and Paralympics, was held on August 3, 2016 in Rio de Janeiro, Brazil. The 5 sports and 18 events that were proposed by the Organizing Committee of the Tokyo Games were approved by a unanimous decision, with Karate officially added as one of the sports for Tokyo 2020. The Japan Karatedo Federation (JKF), which promoted Karate to the Olympic Committee held a press conference on August 4, 2016, at the Nihon Karate-Do Kaikan in Tokyo, Japan. At the Tokyo 2020 Olympic Games, it is planned that Judo matches will first take place, followed by Karate at the iconic sporting hall, the Nippon Budo-kan. We are extremely honored to be able to perform at this renowned home of Budo. At the same time I feel a heavy responsibility. Hereafter, we will further push to foster and strengthen fighters and practitioners, regardless of the different backgrounds of groups and schools, and give it our all as an All Japan Team to push forward for the medals in Japan." on the news of Karate being officially recognized, stated, "I am delighted to hear that Karate has been officially approved as an Olympic Sport for Tokyo 2020. Having devoted my life to Karate, and now in a position to engage in the management of this large karate organization, Kyokushinkaikan, I would like to express my sincere appreciation for the many years of hard work and dedication the JKF has lent to achieve this goal, and will continue to do my utmost from this day forward, together, hand in hand with the JKF, to proliferate one of the traditional cultures of Japan, "Karate-Do". The Tokyo 2020 Olympic Games Organising Committee (TOCOG) has proposed to the IOC Karate as an additional sport for these Olympic Games. The proposal includes the individual KATA categories (male and female) and the individual KUMITE categories (3 male categories and 3 female categories). Formal decision is expected to be carried out at the General Assembly of the International Olympic Committee(IOC) , which is performed in Rio de Janeiro in August 2016 . On the initiative of the IKO and the JKF has now arisen a new collaboration and friendship. The IKO is working for a new partnership between the Full Cantact Karate Organizations that practice full contact karate. The cooperation with the JKF is a fact and the JKF and IKO work together to become in 2020 an Olympic sport. The JKF's General Secretari: "Karate, a martial art consisting of punches, kicks and blocks, is among the sports Japan is considering for inclusion on the Olympic program for the 2020 Tokyo Games. We are happy to work with the IKO and his friends. Although karate has failed to win Olympic inclusion three times before -for the Beijing, London and Rio Games- chances are a lot better this time for the traditional Japanese sport. 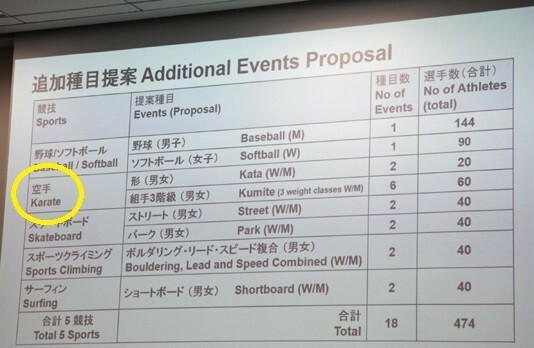 Tokyo organizers, who are also considering the inclusion of baseball and softball, squash and surfing, have until Sept. 30 to select one or more events to recommend to the International Olympic Committee. The IOC's final decision comes in August 2016, when it meets ahead of the Olympics in Rio de Janeiro". New Japan Karate Federation Seidokaikan. All Japan Martial Arts Karate Federation. 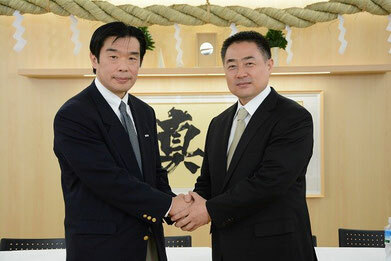 An interview with Shokei Matsui, The President of the International Karate Organization (ICO) Kyokushinkai. 1964 was a landmark for the world of karate in Japan: JKF and Kyokushinkai Organization were established based on “Oyama” dojo. Also this year is remarkable in history thanks to the Olympic Games held in Japan, which has received a special status due to the inclusion of such discipline as judo in the Olympic Programme. At the same time, JKF attempted to achieve karate-do inclusion in the Olympic Programme. A half of a century later the history repeats: Tokyo waits for the Olympic Games and hopes for karate joining the Olympic family. At this time, JKF has developed an entire program to implement the most cherished goal of all karate community under the slogan “Olympic Games 2020”. 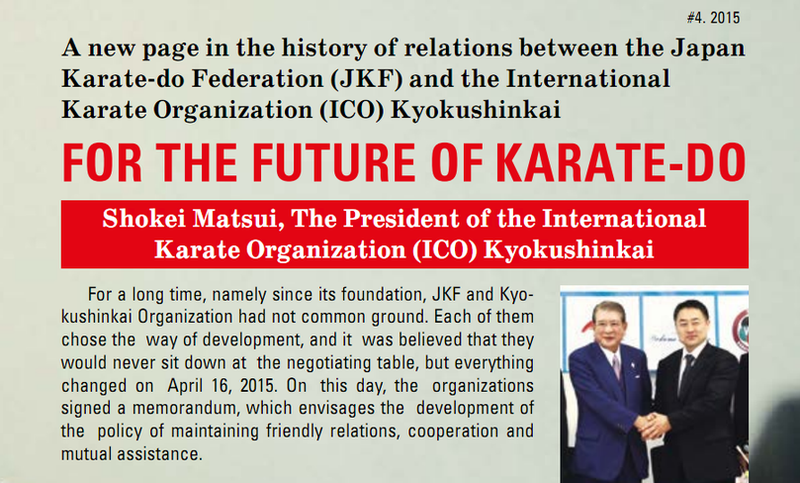 Shokei Matsui, The President of the International Karate Organization (ICO) Kyokushinkai, told us what the impetus was for this turn of events and what to expect in the future. Q: Tell us the background of the memorandum of friendly relations. A: The representatives of our organization have good fellowship with the leaders and representatives of JKF concerning work. 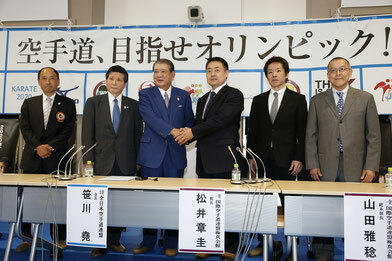 Thanks to the skillful efforts of these people, the first meeting was held in the office of the President of Sasagawa. I think many people know that even before the issue related to the Olympics was raised, I have always advocated that it would be good to unite the world of karate in one thing. And, of course, I have always said that I would be happy to meet the representatives of the traditional flows. And when I was told that Mr. Sasagawa wants to meet me, I realized that, given time, we will talk about the Olympics. Therefore, I gladly accepted the invitation, as I considered it a good opportunity to start a relationship with JKF. I’m sorry, but I had the impression that Sasagawa-san is rather tough and strong person, but when we met, our acquaintance was very warm. I realized what high things this man is concerned with, as far as he is full of thoughts about the development of healthy children and youth. We know that karate-do makes many efforts to get into the Olympic Programme for half a century, and that the IOC recognizes the rules of WKF as the rules of karate. In terms of security, these rules are very good. 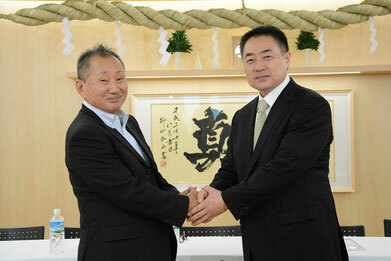 And on the basis of mutual respect, I promised to assist in raising the social status of karate-do. Q: Can you tell us more specifically, what kind of cooperation do you mean? occurred between us, it must be admitted that this resulted in the fact that each party has received some negative impact. Now we have decided to start an interchange of information, recognize some best sides of each other and try to direct all the best to the development of the karate-do world. Someone might say that Matsui “knuckled” under JKF but it is not true. Our friendly relations are built on the recognition of the charm of the contact battle. Our main principle is mutual respect and non-interference in each other’s lives. Thus, I think that the movement “in the Olympics” became a good opportunity for rapprochement. I heartily wish that karate to become the Olympic sport. But even if something goes wrong and fortune does not favors us, the establishment of friendly relations will influence very well on karate and its future. Q: If karate-do will be the Olympic sport, what will kyokushinkai acquire? A: As it has been said already, despite the fact, whether karate will be a part of the Olympics or not, we still want to interact at both the organizational and the human and technical level. Especially we want to start to learn the rules of JKF. When I was an active athlete, I often thought about how I would have played in the tournaments of JKF. I think we could learn the technique from a distance. I plan to invite instructors from JKF and conduct the seminars for all comers. But if karate becomes the Olympic sport, I would like to grow at least one athlete to participate in the Olympic Games. However, all this will be not forcibly, but taking into account the wishes of everyone. Q: Thank you very much for the interview. 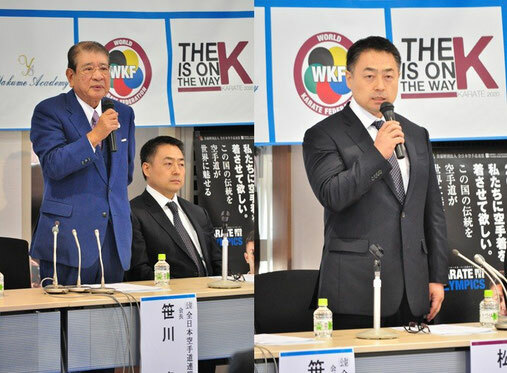 On April 16, 2015, the IKO Kyokushinkaikan held a joint news conference with the Japan Karate Federation (JKF) at the Japan Karate Federation Center, Kouto-Ku, Tokyo, Japan. The purpose of the conference was to announce the commencement of a joint effort, as collaborator organizations, to further develop Karate, with the combined goal to enter Karate as an official competition at the 2020 Olympic Games and Paralympic Games in Tokyo. 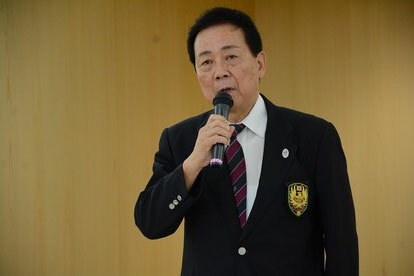 The JAPAN Karatedo Federation and International Karate Organization Kyokushinkaikan (Director: Matsui Shoukei) conducted a press conference on April 16th at the assembly hall of the Japan Karatedo Federation. 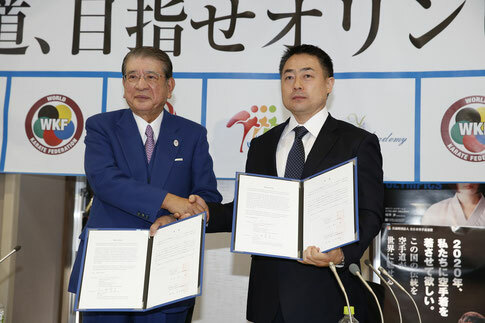 The aims were two-fold: to develop Karate activities to make it even more popular than before, and to build friendly ties and collaborate with one another so that Karate could be recognized as a sport for the 2020 Tokyo Olympic and Paralympic Games. Along with the President, Mr. Sasagawa Takashi; Vice-President, Mr. Kurihara Shigeo and Secretary-General for the World Karate Federation, Mr. Nagura Toshihisa from JKF, the Director, Mr. Matsui Shoukei; Executive General Manager, Mr. Yamada Masatoshi and Director of International Affairs, Mr. Gorai Katsuhito from Kyokushinkaikanattended this press conference. 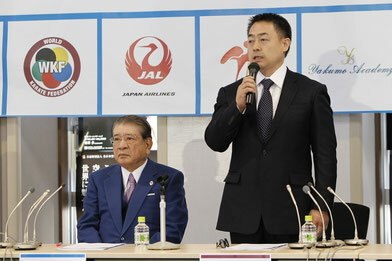 At the press conference, President Sasagawa first explained the reason for establishing friendly ties this time round, saying that “we need to stay united together and learn from one another so that Karate can become more popular and be acknowledged as an Olympic sport”. Director Matsui followed his lead and emphatically commented, “may this be a catalyst so that we can work towards bringing about the rise of status of Karate in our society”. 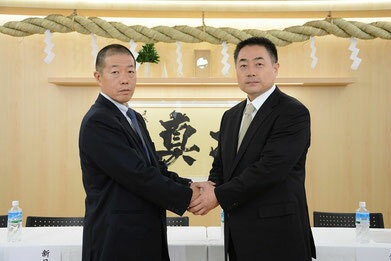 President Sasagawa and Director Matsui then signed a memorandum of agreement in front of media personnel at the press conference so as to cement the establishment of their collaborative ties. 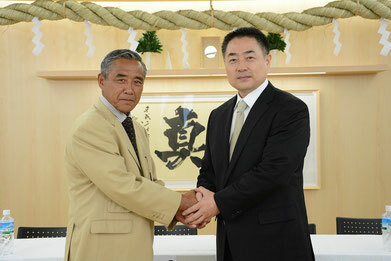 In regards to future plans, JKF will support Kyokushinkaikan in the organization of All-Japan Karate Championship. Kyokushinkaikan members will also participate in the tournament organized by JKF. 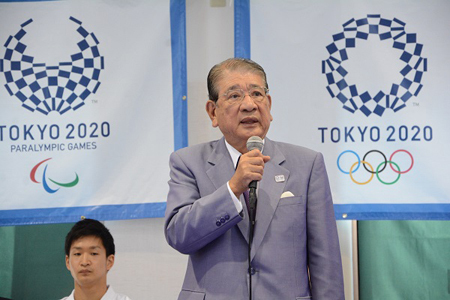 In addition, Vice-President Kurihara and Secretary-General Nagura explained about their areas of focus in the future as well as the route they intend to undertake to enable Karate to be recognized as a sport for the 2020 Olympic Games. Besides this, a ceremony to confer Mr.Xenou Geogia-Archontia of Greek descent as the new 2020 Tokyo Karate Ambassador was held. President Sasagawa presented the certificate to Mr. Xenou Geogia-Archontia. 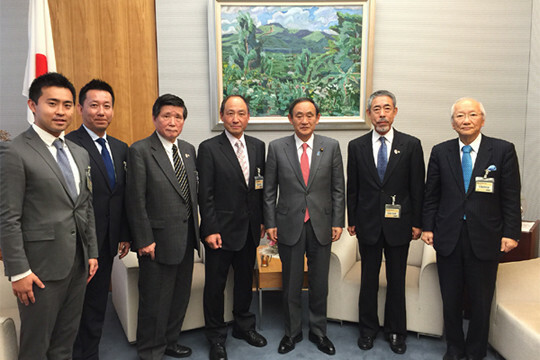 On March 9th 2015, officials from both the JAPAN KARATEDO FEDERATION and the WORLD KARATE FEDERATION visited to confer with Chief Cabinet Secretary SUGA YOSHIHIDE. 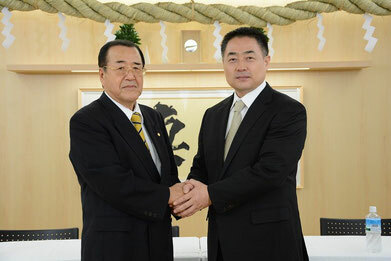 Chief Cabinet Secretary Suga serves as chairman of the Federation of Diet Members for the Promotion of Karate and submitted a resolution of the Federation’s general meeting to Prime Minister ABE SHINZO, making him a powerful supporter in the campaign for the adoption of karate as an official Olympic event. At this conference, he once again offered words of support regarding the adoption of karate in the 2020 Tokyo Olympic and Paralympic Games.